Bright, colorful, young artists please the visitors of Art Tower Gallery with their unique and original art works. 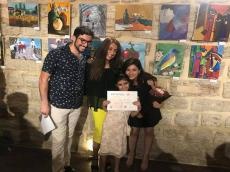 Arts School students presented their paintings in Art Tower Gallery on June 14.The exhibition featured works by students of Sayali Mammadova, Trend Life reported. Sureya Mammadli, Israfil Gurbanzade, Fatima Hasanova, Sadaf Hajiyeva, Mehdi Gasimzade, Orhan Rzayev, Neslihan Muradova, Mehriban Rzayeva, Nazila Hasanova, Muhammad Gurbanov, Gamar Bayramova, Leyla Suleymanova, Mehdi Inji, Medina Mammadova, Maryam Guliyeva, Orman Marifli, Samra Marifli, Amina Aliyeva, Nazrin Huseynova, Aysel Murshudlu, Fuad Abbasov and others showcased their works as part of the exhibition. Young artists created exceptional art which shows extraordinary talents and unique aesthetics. Beautiful landscapes, still lifes, animals and fairy-tale characters occupy a special place in their art works. Addressing the event, the head of NGO Arts Council Azerbaijan, famous artist Dadash Mammadov, the head of Art School project, Sona Guliyeva, and the teacher, Sayali Mammadova, said that the exhibition presents an annual result of academic year. They stressed that artists created wonderful works, which reflected their emotions. The artists were able to transform their feelings into vibrant art works at such a young age. All this shows the serious creative approach of the young talents at Art School. Young artists were awarded diplomas. The exhibition will last until June 23. Admission is free. Operating since 2010, Arts School is a project of Arts Council Azerbaijan. It aims to develop the creative potential of young artists. The project manager is Sona Guliyeva.